Last year, we celebrated (or is it cele-Bard-ed?) Shakespeare's 450th Birthday in Bryant Park. We had so much fun with the event last year that we're celebrating his 451st Bard-day tomorrow. Starting at 12:30, actors from The Drilling Company perform some of the Bard's greatest speeches, sonnets, and lines. Next, enjoy Shakespeare-inspired music from the NYC-based folk band Thicket and Thistle. 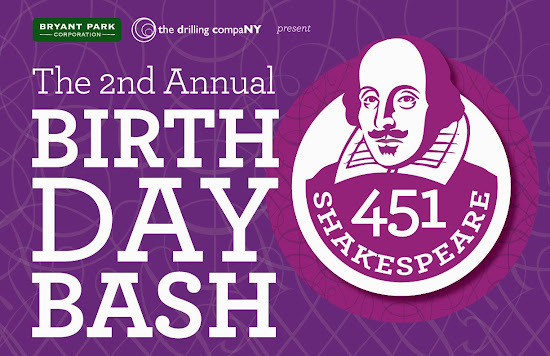 Deliver your favorite Shakespearean speech and win a Birthday Bash T-shirt. The festivities conclude at 2:30 with "Boosting the Banner," when Shakespeare Birthday Bash banners are raised for all to enjoy. Celebrating Shakespeare's birthday is just the beginning of a whole summer of Shakespeare. Last summer we enjoyed performances of two Shakespeare plays--Love's Labour's Lost and Hamlet--and everyone knows that three is better than two. This year, The Drilling Company will perform The Two Gentlemen of Verona, Romeo & Juliet, and The Taming of the Shrew for three weeks each.